106 pages | 71 B/W Illus. DISTRICT COOLING: THEORY and PRACTICE provides a unique study of an energy cogeneration system, set up to bring chilled water to buildings (offices, apartment houses, and factories) needing cooling for air conditioning and refrigeration. In winter, the source for the cooling can often be sea water, so it is a cheaper resource than using electricity to run compressors for cooling. The related technology of District Heating has been an established engineering practice for many years, but District Cooling is a relatively new technology now being implemented in various parts of the world, including the USA, Arab Emirates and Kuwait, and Saudi Arabia. Existing books in the area are scarce, and do not address many of the crucial issues facing nations with high overall air temperatures, many of which are developing District Cooling plans using sea water. 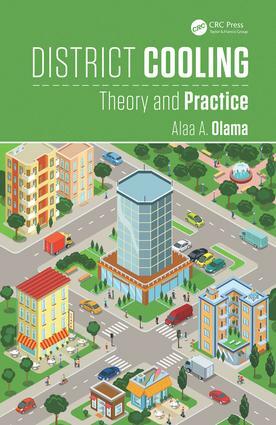 DISTRICT COOLING: THEORY & PRACTICE integrates the theory behind district cooling planning with the practical engineering approaches, so it can serve the policy makers, engineers, and planners whose efforts have to be coordinated and closely managed to make such systems effective and affordable. In times of rising worldwide temperatures, District Cooling is a way to provide needed cooling with energy conservation and sustainability. This book will be the most up-to-date and comprehensive study on the subject, with Case Studies describing real projects in detail. "Excellent, comprehensive and very practical book and guide to the extensively used technology of district cooling." Introduction. Economic Considerations. Design of Central Plants. Design of Chilled Water Distribution Systems. Design of Energy Transfer Stations. Design of Thermal Energy Storage. Control, Instrumentation and Energy Metering. Operation and Maintenance. Case Studies. Codes, Standards, and Best Practices. Dr. Alaa A. Olama is a refrigeration and air conditioning expert with a long record in district cooling and absorption refrigeration in Egypt and the Middle East. He is presently affiliated with the American University in Cairo, Egypt.